I don’t know about you but in our house we can always use more storage space. A cabinet like this three drawer one from Brylane Home, not only provides additional storage but it adds to the décor! It can easily be a wonderful addition to any room in the house with it’s neutral tones and classic lines! 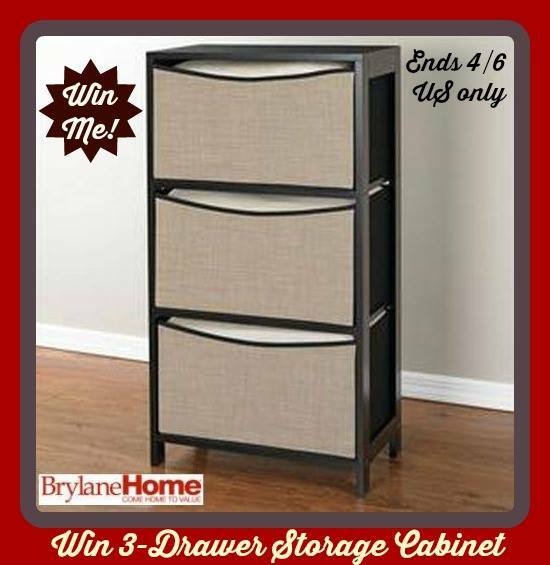 Visit Brylane Home for this 3-Drawer Storage Cabinet, along with many other selections. They have a great selection of quality storage solutions at awesome prices! I personally love their bedding selection (not to mention prices), small kitchen appliances and outdoor products. Actually I love everything at BrylaneHome! This would be great for my bedroom! I need storage in every room! Our house is being built and we are living in a camper right now. I could certainly use this in my bedroom. My living room. My sons have overtaken! I really don’t have a night stand or a dresser so I’m using this fort makeup meds etc.. I need help with storage in my kitchen. I need extra storage in my room, my daughter’s room, and our computer room. I so need it in the bedroom! I sure could use x-tra storage. I need stoarge for the guest bedroom. I’d put seasonal bedding in it. Thanks. I need more storage in the bathroom! I need storage in my walk in closet. I would it in my grandchildren s room. They visit often and I keep extra clothes here for them. I don’t have anywhere to put them now. They’re just stacked on a table. Thanks for the chance. Every room honestly, but mostly in the living room to catch all the toddler toys. I need more storage in the bathroom and daughter’s room. I need storage in my granddaughter’s bedroom. She recently moved in with me and I converted my den into a bedroom space, but I have no dressers or closets for her. It’s sad, she needs storage space badly. I need storage in the bedroom and laundry room. Both rooms are getting “do overs” soon to help and organize. I need extra storage in my Son’s room. I don’t think there’s a room I couldn’t use extra storage in! But I could really use it in the den, as there’s all sorts of miscellaneous stuff in there that needs a home. The whole house but especially the “croffice” (craft room/office)! I certainly need storage in my bedroom~and my storage room,ever since we down-sized. to a smaller place to live. What room do you need storage in? I really could use this in my bathroom, it would be perfect! I need storage in my craft room and kids play room. I could REALLY use this in my bedroom. We just moved and everything is smaller. Storage is needed! I need storage in my son’s bedroom and our guest bathroom. I need storage in my garage. have a new grandbaby, so i need more storage space in the bedroom. Who Doesn’t Need more Storage? I would use this in my bedroom. MY BEDROOM NEEDS THIS BAD.!!! I need storage in my bathroom! Thanks for the giveaway! I need more storage in my bedroom. I need storage in my bedroom. I had to eliminate a large dresser to fit my king size bed and now I need somewhere to put the stuff. Would be geat to store cloth dinner napkins in along with the napkin holders. I need it in my bathroom and living room. I really need something in my spare bedroom for guests. would not fit in our condo,so we sold~this would definitely fit our life style. My bedroom needs this bad. oh goodness…every room? 🙂 we are moving and boy oh boy this sure would come in handy! I would not be a answer though,so I would have to say my bedroom. My living room needs some organizing and storage! I could definitely use more storage in my bedroom. Dd’s playroom is the worst! I def need storage in my bathroom….it’s so disorganized. Seriously, though, if I were the lucky winner, this cabinet would probably find a place of honor in the master bedroom. We need storage in the bathroom. To be honest all of them. I can say that I need help with organizing the rooms in my house. I could really use this in my bedroom! My daughters room for some of her toys. It seems like I need storage everywhere! But I would probably put this in my bedroom. This would help tidy up my mudroom area. I need more storage in my kitchen. Great storage for my front entrance for mitts in the winter and sandals in the summer! I need more storage space in my bathroom. This would be great for the bathroom. We need extra storage everywhere but I think I would put this in my husbands computer room to get some of the clutter put away. My bedroom needs more storage. I would use this in my bathroom we just don’t have enough space for all our things and I can’t stand clutter or things not being organized. Our teen son’s bedroom, this would be awesome for all of his sports equipment, socks, gloves, and uniforms. I need storage in my bedroom. I have one dresser for my husband and I to share. I need more storage in all our bedrooms. I need storage in all of my rooms, but especially my livingroom. I need extra storage in my home office, actually I need it throughout the whole house. I need more storage solutions throughout my house. My office/art studio is the room that I would most like to organize and renovate. I need extra storage by my desk in our living room. I need extra storage for my livingroom. My bathroom has no drawers and sure needs this. I need extra storage in every room but mostly my sons rooms! What room do I NOT need storage in would be answer! This would probably go in my son’s room. I could use this in my walkin closet. I need storage in my bedroom. I need storage for my bedroom. I need storage in our master bedroom closet. We can use storage in our living room for toys. MY bedroom needs this so badly!! I only have 3 tiny drawers as it is, and only 2 work!! I am currently keeping all of my socks in reusable fabric shopping bags!! There is nowhere else to put them!! PLEASE, help me make my house neater!! I need storage in my bathroom! Oh….EVERY ROOM. It would be really nice, though, to have it in my husband’s home office or by my desk in the living room. My sons room could def use this! My son needs storage in his bedroom. I need storage in the bedroom.